Yoga is a great way to release stress, increase flexibility, and get a low-key workout. If you’re interested in yoga and you’re not sure where to start, try mastering these eight beginner poses. The tree pose is great for balance and concentration. To do the pose, place your right foot on your left leg, just above your knee. Then, place your hands in front of you, palms together. Hold the pose for about ten seconds, and then switch feet. This is a classic yoga pose that gives your calves a surprisingly good workout. Start by bending over and placing your palms on the ground. Then, go up on your toes and push your heels towards the ground. Try to lower your heels as far down as you can, because this will give your calves the best workout possible. The warrior pose gives your thigh muscles and hamstrings a good stretch. Start by positioning your feet so they’re facing left. Then, bend your left leg until it’s parallel to the ground. Stretch out your arms and fingers, and stare at the fingers on your left hand. Hold the pose for ten seconds, and then switch to the right side and do it all again. The seated twist, also called the half lord of the fishes pose, stretches out your back nicely. Start by draping your left leg over your right leg, putting your left foot firmly on the ground. Then, place your left hand on the ground and twist to your left side. Hold the pose for about ten seconds, and then switch to the other side. The bridge pose works your core and back muscles. Lie down on the floor and place your feet on the ground. Pull yourself up onto your shoulders, using your core muscles to hold the position. You can do this pose for ten to twenty seconds, or as long as is comfortable for you. The plank pose is the perfect workout for your arms. Lie down on the ground and then pull yourself up by your arms. Hold the position for as long you can, breathing steadily the whole time. To do the boat pose, start by sitting on the ground. Then, lean back and hold your legs out in front of you, using your core muscles to balance. The farther you lean back, the more challenging it will be, so for a serious core workout lean as far back as you can. Finally, end your workout with the calming child’s pose. 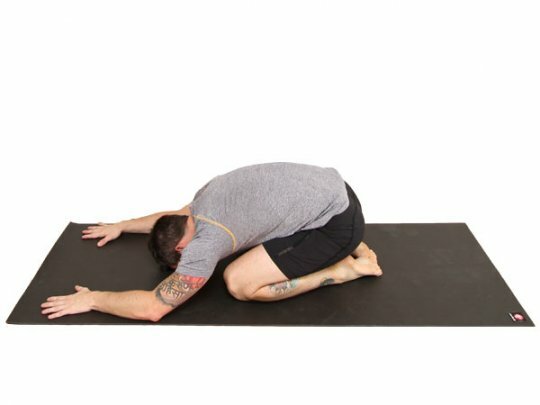 To do this pose, kneel on the ground. Then, lower your chest and head onto the ground in front of you, with your arms reaching forward. Stay in this pose for as long as you want, breathing evenly. As you sit there, you’ll feel how good a stretch your muscles have gotten from your yoga routine.